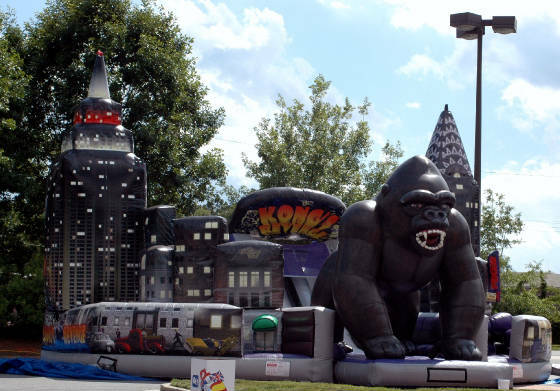 Castle Party Rentals is the leading provider of equipment rentals and entertainment for Geneva, Illinois. We offer a wide variety of items and services at an unbelievable price. Castle Party Rentals carries liability insurance and is certified by the state of Illinois. Our customer service will go beyond your expectations. 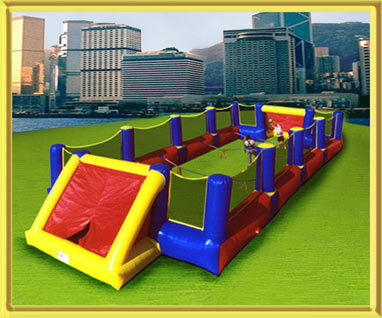 At Castle Party Rentals, we not only have a price match guarantee, but will beat all competitor pricing by 10% on similar items. Please let us know how we compare to our competition so that we can serve you better! Please use the menu bar option on the left to learn more about our products and services. You will be able to see pricing, pictures, and other important party rental details. Geneva Moonwalk Rentals are very popular in the summer. They are affordable, entertaining, and safe. As you can see, we have a wide variety of Geneva Moonwalk Rentals available to rent. All of our Geneva Moonwalk Rentals are at least 15' x 15' allowing for a capacity of 8-10 kids at one time. If you have any questions about any of our Geneva Moonwalk Rentals, please feel free to contact a Castle Party Rental representative at (630)-400-6545. Our Geneva Moonwalk office is open from 8:00 am to 8:00 pm daily. Geneva Bounce House Rentals consist of a slide, jumping area, climbing wall, and basketball hoop all put together into one fun interactive inflatable. Castle Party Rentals carries two different types of bounce house combos, a standard bounce house combo and a mega bounce house combo. Regardless of which Geneva Bounce House Rental you decide upon, your children will still be entertained for hours on end with all of the extra activities available in comparison to just a moonwalk rental. These Geneva Bounce House Combos are becoming very popular, but they are a new concept, so if you have any questions, please feel free to contact a Castle Party Rentals representative at (630)-400-6545 and they can answer all your Geneva Bounce House Combo questions. Geneva Slide Rentals are one of a kind. Castle Party Rentals now also offers water slide rentals and huge corporate event slides. The weather man is expecting a hot humid summer so why not cool off with Geneva water slide rental. Our Geneva slide rentals come in a variety of shapes and sizes but will definitely attract a large crowd and entertain for hours on ends. Please note that our Geneva Water Slide Rentals require a water source such as a garden house to utilize. Please call a Castle Party Rentals representative to discuss your Geneva, Illinois slide rental or water slide rental. Geneva Obstacle Course Rentals are very entertaining. We not only carry the largest obstacle course rentals in Geneva, but also throughout Illinois. We maintain competitve rates on our Geneva Obstacle Course Rentals, but just to make sure, we have developed our price match guarantee. If you find a similar obstacle course for a better price, we will not only match our competitor's rate, but we will also beat it by 10%. 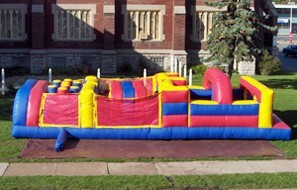 To learn more about this Geneva Obstacle Course Rental policy, please call a Castle Party Rentals representative at (630)-400-6545 and we can work out a price that satisfies your party rental budget and entertainment needs. Castle Party Rentals offers many inflatable game rentals to its Geneva, IL customers and residents. The Geneva Game Rentals are very interactive and can entertain children for hours on end. We have boxing ring rentals, mechanical bull rentals, velcro wall rentals. rock climbing wall rentals, bugee run rentals, and much more. Looking for a game not pictured above? Then please give Castle Party Rentals a call at (630)-400-6545 and we should be able to get it for you. Castle Party Rentals offers Geneva Tent Rentals as well. We have tent rentals for all different sorts of Geneva, IL events. We have tents for small dinner parties of 10 people to tents for large corporate functions of over a 1,000 people. We also carry a variety of different kinds of tents in Geneva such as different shapes, colors, and sizes. For all your Geneva Tent Rental needs, please contact a Castle Party Rentals representative so we can put together a great package for you! (630)-400-6545. Our Standard Party Tents are what we suggest for a simple and affordable party. These tents are the most common rental and can also come in a variety of colors such as white, blue, yellow, green, etc. They provide some great shade for your guests and really enhance the atmosphere. These tents are installed with excellence by our trained staff members. These tents will protect you from the rain or shine at an affordable price. Call for tent tentals in Geneva, Illinois. Our High Peak Pole Tents are amazing. They are constructed by Anchor, the most premier manufacteror in the undustry. All of these tents have white tops. Their high peaks can be seen from miles away and they sparkle as they reach towards the sky. Not only do they protect you from the sun, but are quite a site. These are highly recommended for high class events such as weddings, corporate events, festivals, etc. Obviously they can accomodate large crowds. If you are looking for an even larger tent than we have listed, then please give call us for their pricing. Call for tent rentals in Geneva, Illinois. Frame tents are very ellegant, yet very heavy, involve many pieces, and are quite a timely item to install. Due to this, frame tents must be installed by our highly trained staff. Frame tents have no center pole, which provides our customers with a greater amount of space. If you plan to set up a tent on a hard surface such as concrete or ashalt, then such a tent is necessary because it allows us to utilize sandbags. Call for tent rentals in Geneva, Illinois. Our Even Pole Tents are for parties and events that need to cover a lot of people. We offer some of the nicest and most affordable event tents so that you can protect you guests from the heat, the rain, or provide your event with an overall feel of elegance. Our Event Pole Tents only come in the classic white color. Call for tent rentals in Geneva, Illinois. If you need any addition Geneve Tent or Canopy Accessory Rentals, please contact a Castle Party Representative at (630)-400-6545.